A DGI strategy provides almost everything that most retirees would need: decent income, relative safety, and reasonable growth. Our Passive DGI Portfolio is in its 5th year. We will provide the 1st quarter 2019 review. The portfolio has returned an annualized return of roughly 11% since inception. We will provide updates on changes, additional investments, dividends collected and overall performance. The year 2019 so far has been pretty good for stocks. From the lows of the last quarter of 2018, the S&P 500 gained roughly 13.5% during the first quarter. Our DGI portfolio gained 12.4%. 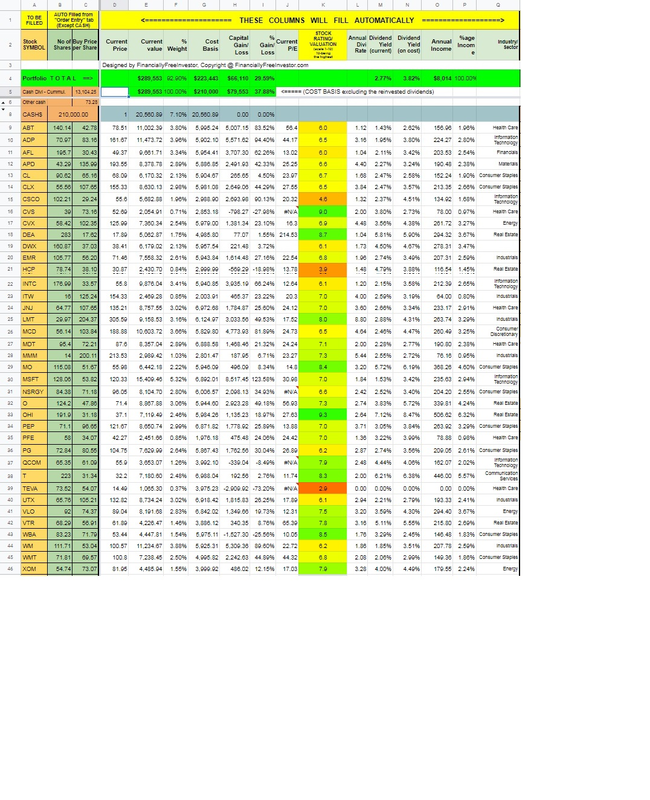 However, during the last 12 months, DGI portfolio beat the S&P 500 by a large margin, 17.7% gain for the DGI portfolio versus 8.28% gain for the S&P 500. The DGI portfolio completed 4 years as of August 2018 and is in its 5th year. The overall record of this portfolio demonstrates that in turbulent times, this portfolio will not only continue to provide nice dividends but will also provide some element of capital preservation. Why Invest In A DGI Portfolio? DGI generally means that you invest in a set of dividend-paying stocks that grow their dividend payout year after year. If you are still in the accumulation phase, you could re-invest (drip) the dividends, which would result in more shares and higher future income. With each passing year, this growth of dividend-income becomes bigger and bigger. We should mix high-yielding, slower growth companies with low-yielding fast-growing ones. We should also diversify among various sectors and industries. If implemented with some prudent planning and over an extended period of time, the DGI strategy can provide almost everything that a retiree needs, decent income, relative safety, and reasonable growth. Sure, there is a drawback with this strategy that it cannot provide a very high level of income, so one would need a sizable amount of savings to generate the required amount of dividend income that one could live off comfortably. It may be worth reiterating why we believe in the DGI strategy and consider it as the “core” portfolio. A well-thought-out DGI strategy would outperform the broader market over the long term. It will also offer less volatility and smaller drawdowns during recessions and bear markets. It was proven during the 2008-2009 recession as well when the drawdowns of most DGI portfolios were 1/3 rd less than that of the S&P 500. Also, a significant stream of dividend-income would make it a little easier to wait out any downturn. Another big advantage of a DGI portfolio is that it requires little work after the initial set-up. The best part is that it is a far superior strategy to draw 4% inflation-adjusted income (on the invested capital) compared to index investing since it lets you do this without ever selling the shares. We launched this DGI portfolio nearly over four and a half years ago in August 2014. We wanted to create a well-diversified portfolio with mostly blue-chip companies which had a history of raising dividends year after year and hold them for years. We also wanted to invest over an extended period of time so as to take advantage of Dollar-Cost-Averaging and create a decent enough income stream without the need to ever withdraw the capital by selling shares. We named this portfolio "Passive" because we thought it would require minimal management. Many times there is no action in this portfolio for months. Select 30 plus solid dividend-paying, dividend-growing companies and invest the initial capital divided equally. Invest additional money on fixed intervals according to a pre-determined schedule. Use dollar cost averaging and buy in a spread-out manner on a set timetable. Stay consistent, and rarely sell or replace a company. Reinvest the dividends for the first 5-10 years or more (depends on personal situation), to grow the yield on cost (YOC). Thereafter, reap the benefits! $1,000 invested on August 1, 2014, in each of 30 original stocks, total $30,000. $1,000 invested on November 3, 2014, the first trading day of November 2014, in each of 30 stocks, total $30,000. Starting February 2015, every year on the first day of trading in February, we invested $1,000 in each of the 30 stocks (total $30,000 each year). This was completed for the years 2015, 2016, 2017, 2018 and 2019. These annual investments will continue until the year 2024. In 2017, we stopped reinvesting dividends automatically. Instead, we now let the cash accumulate and invest when we feel the price is right. The original article that launched the portfolio can be accessed here and here. Over the years, we added a few additional stocks. Below is the current list of 38 stocks with the industry/sector information for easy reference. As per our annual schedule of contribution in the first week of February, we added $30,000 of new money to this portfolio. We invested $1,000 into 15 out of 38 securities at the time. The reason we invested in only 15 stocks was that we wanted to be selective since we only wanted to invest in stocks that were not too expensive. The other reason was that we were low on cash and wanted to keep some reserve for future opportunistic purchases. The criteria that we used in selecting the 15 out of our existing 36 stocks are described below. We had 38 positions in the portfolio. We needed to select 15 out of 38 positions to invest $1,000 in each of them. Our criteria for selection were two-fold. First, we would see the relative valuation and second the safety and growth of the dividend. We selected the following 15 stocks for purchase as of the first week of February. In the table below, the last column “Dividend Safety Score” is derived giving equal weight to four factors, i.e., Credit Rating, Debt/Asset Ratio, Payout-Ratio, and 5-Yr Dividend Growth. The portfolio table below was sorted on the performance since the beginning of 2018 in ascending order (discount offered by current prices compared to the beginning of 2018). The rows highlighted in GREEN color are selected for the additional investment of $1,000 each. Note: Starting in April 2017, we made a change with regards to the dividend reinvestment policy. We stopped reinvesting the dividends automatically. This was to allow us to build some cash position and make some opportunistic buys from time to time. In 2017, CVS (CVS Health) froze its dividend at $0.50 per share due to its acquisition of Aetna Inc. (NYSE: AET). The acquisition has now been completed in 2018. HCP had to cut its dividend by 35% in 2017, following ManorCare assets spin-off in 2016. Since then, it has been paying a constant amount of $0.37 per share. TEVA eliminated the dividends entirely in the fourth quarter of 2017. CVX (Chevron) had paid the same $1.08 quarterly dividend for five quarters, until February 2018. It finally raised the dividend in 2018 to $1.12 per share, followed by a raise in 2019 to $1.19 per share. Out of 35 individual stocks in 2017, dividends were increased by 30 companies, kept the same by 4 companies, and cut by one. A total of 33 companies announced dividend increases in 2018. The average increase was roughly 8.8%. If we were to count all of the 38 positions, the average came to roughly 7.6%. 16 companies have already raised dividends in the year 2019, with an average raise of 5.71%. Two companies (CVS, HCP) have their dividends frozen currently. Another position DWX is an ETF that pays a variable dividend. 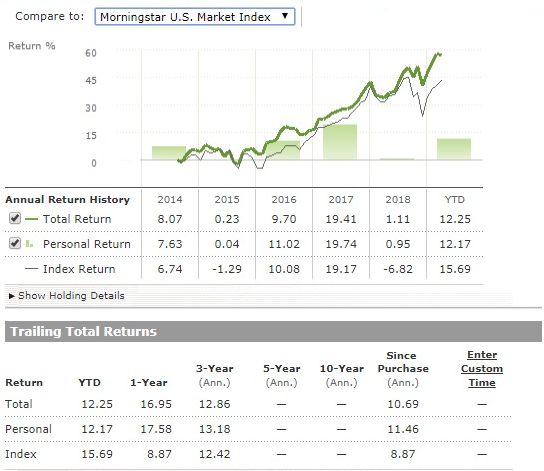 Note: Morningstar describes ‘Personal Return’ as follows: The calculation of Personal Return illustrates how your allocation of capital has affected the performance of your portfolio. In the above table, P/L columns do not account for the dividends that were not reinvested. Also, the total cost in the last row represents the sum total that was invested in the portfolio. Both CVS and WBA (Walgreens) have been repeatedly hit on the fears of Amazon's entry into the pharmaceutical business and the headwinds faced by the retail business in general. However, Amazon's threat has been overhyped. Let’s not forget that CVS and WBA have huge advantages in terms of their expertise in the pharmaceutical business and having their retail pharmacy stores within 5 miles of 75% of the US population. Nonetheless, there is no denying that these stocks have vastly underperformed the broader market and will probably continue to do so in a foreseeable future. But they are not going extinct and they will keep paying nice dividends to the patient investors, while they work through their challenges. TEVA: We still maintain a small position in TEVA, though it pays no dividends. The position weight is almost insignificant and less than 0.50%. We have written enough about or reasoning why we still have this stock. Please see our past review here. We know that there are always going to be a couple of stocks in your portfolio that are not going to pan out according to your expectations. That's why diversification is so important. But more importantly, this demonstrates that one or two bad choices are not going to have any meaningful impact on the overall portfolio. The DGI portfolio plays an important and foundational role in our overall investments strategy. We believe the DGI strategy described above is one of the simplest ways to accumulate wealth over a long period of time. This portfolio is simple, easy to implement and hassle-free. Our allocation model follows a multi-basket strategy. 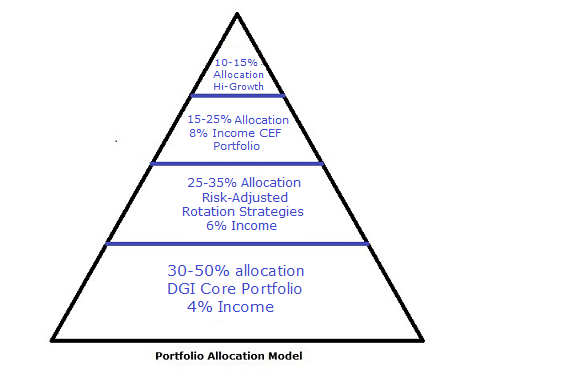 The model suggests investing 30-50% of the investment assets into DGI. The rest is allocated to other compelling strategies that provide us the strategic diversification. We invest in alternate portfolio strategies, mainly to enhance the current income and to hedge the risks by using Rotation strategies. A multi-basket approach certainly requires more effort and may not be suitable for everyone. For more passive type investors, a DGI strategy is ideally suited as it requires very little effort, mostly just a few times a year. It is a well-accepted notion that over a long period of time, the dividend-paying companies provide a higher total-return compared to non-dividend-paying companies. We feel in the long term this portfolio will offer better returns, lower volatility and drawdowns, and consistent and growing income. In addition, it requires minimal management. 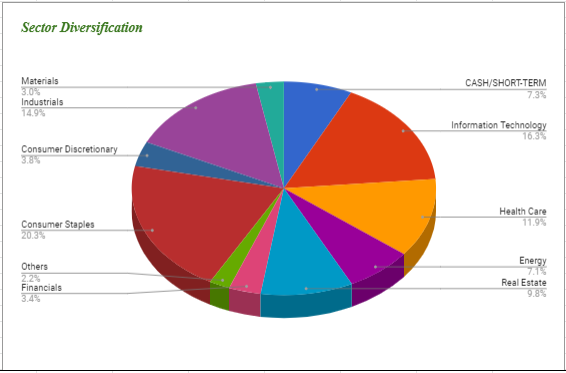 Below is our investment allocation model. These allocations are just for broad guidance; everyone should decide what is right for them based on his/her goals, income needs, and risk tolerance. High Income DIY Portfolios: The primary goal of our "High Income DIY Portfolios" Marketplace service is high income with low risk and preservation of capital. It provides DIY investors with vital information and portfolio/asset allocation strategies to help create stable, long-term passive income with sustainable yields. We believe it's appropriate for income-seeking investors including retirees or near-retirees. We provide six portfolios: two High-Income portfolios, a DGI portfolio, a conservative strategy for 401K accounts, a Sector-Rotation strategy, and a High-Growth portfolio. For more details or a two-week free trial, please click here or on the image below our logo above. Disclosure: I am/we are long ABT, ABBV, JNJ, PFE, NVS, NVO, CL, CLX, GIS, UL, NSRGY, PG, KHC, ADM, MO, PM, BUD, KO, PEP, D, DEA, DEO, ENB, MCD, BAC, UPS, WMT, WBA, CVS, LOW, AAPL, IBM, CSCO, MSFT, INTC, T, VZ, VOD, CVX, XOM, VLO, ABB, ITW, MMM, LYB, HCP, HTA, O, OHI, VTR, NNN, STAG, WPC, MAIN, NLY, ARCC, DNP, GOF, PCI, PDI, PFF, RFI, RNP, STK, UTF, EVT, FFC, HQH, KYN, NMZ, NBB, JPS, JPC, JRI, TLT. I wrote this article myself, and it expresses my own opinions. I am not receiving compensation for it (other than from Seeking Alpha). I have no business relationship with any company whose stock is mentioned in this article. Additional disclosure: The information presented in this article is for informational purposes only and in no way should be construed as financial advice or recommendation to buy or sell any stock. Please always do further research and do your own due diligence before making any investments. Every effort has been made to present the data/information accurately; however, the author does not claim 100% accuracy. The stock portfolio presented here is a model portfolio for demonstration purposes; however, the author holds many of the same stocks in his personal portfolio.